We have seen the successful application of Australia’s Landcare model in Australia and developing countries, and the Crawford Fund has supported landcare training over the years, most recently in Africa. Now, a group of Australians are looking at applying another Australian idea to suit the needs, aspirations and opportunities facing farmers and foresters across Africa with Master Tree growing training. The Crawford Fund supported a visit to Australia by five African farmers and two international aid workers for a master tree grower training course to improve farm forestry. For some of them, it was their very first trip overseas. “The Australian Master TreeGrower (MTG) program provides education and extension support to Australian farmers growing trees for conservation and profit,” said Jon Lambert, Chief Executive Officer of Beyond Subsistence, a non-profit group that provides forestry and agroforestry support to aid organisations. Developed in 1996 by forester Rowan Reid through the University of Melbourne, the MTG program has delivered over 100 courses involving more than 2000 farmers across Australia. 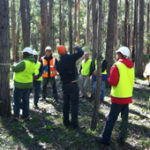 A number of independent reviews have concluded that the Australian MTG program is more than just a short course: it has changed the nature of farm forestry extension in Australia. “The philosophy of the MTG program has been its success. The courses aim to train farmers through shared experiences and group discussion rather than relying primarily on expert tuition. The format is consistent in each course, however, the content varies depending on where the course is run and the local challenges that need to be addressed. The academic level is also varied depending on the participants, making it an excellent course for application in developing countries,” said Jon. A typical MTG course runs for approximately eight days, and covers topics such as management, measurement, economics and markets, with a range of field trips to see real examples and gain hands-on experience. It also puts tree growers in contact with other enthusiasts and a range of agroforestry experts who can assist them into the future. The idea to develop an African MTG program came about when Australian MTG coordinator, Rowan Reid, and Beyond Subsistence CEO, Jon Lambert, attended an agroforestry workshop in Nairobi, Kenya. Jon was a student of Rowan’s from the University of Melbourne and had been a facilitator and guest presenter at a number of Australian MTG courses over the years. During the workshop they discussed working together and set their sights on developing the African MTG course. “The first step was to invite a group of African extension agents to Australia to see how MTG courses are run and explore how they could help design and promote a series of courses back in their home countries. With funding and support from a range of groups, including the Crawford Fund, Beyond Subsistence brought five African nationals, from Uganda, Ethiopia, Kenya and Lesotho, and two Americans who are working in Niger to Victoria for the two-week course,” said Jon. “The first week was spent in Gippsland and included tours of various forestry projects and sawmills as our African friends were shown how we teach farmers about markets, measurement and management of trees on farms. “The second week was spent with the Otway Agroforestry Network and focused on the design of revegetation projects that reflect the interests and aspirations of landholders. 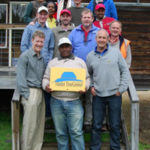 The participants visited nurseries, farms and native forests and had a chance to experience our unique wildlife, beautiful beaches and rural hospitality. Beyond Subsistence has already begun raising funds for courses to be run in Uganda and Niger in 2013. These courses will involve researchers, extension agents and leading local farmers and will kick start a series of new courses run by Africans in their own communities. “Like the Australian MTG, the course will not be specifically promoting forestry on farms: it will assist farmers to explore opportunities for using trees to improve their livelihoods. Unlike the Australian MTG course however, the outcome of the African MTG has the potential to save the lives of many people who face starvation on a regular basis, “concluded Jon.